Pallbearer hails from the small southern city of Little Rock, Arkansas, a town known for its historic desegregation battles, its rampant gang violence, and for being the birthplace of former U.S. President, Bill Clinton. Arkansas is one of those states that is often overlooked in the United States, even by its fellow southern neighbors. Generally the only time it receives any attention is when it’s launched into the national spotlight for something negative, like racism, intolerance, or injustice. Anyone remember the West Memphis Three? In learning that Pallbearer comes from Arkansas, it occurred to me that I’ve never really heard of very many bands or musicians coming from there, (Johnny Cash is one notable exception, as are Pallbearer’s fellow doomsters, Rwake.) This got me wondering what it’s like to grow up in a place that gets such a bad rep, particularly if you’re a young guy in a heavy band. In the case of Pallbearer, it would appear that writing loud, pummelling music with an underlying melancholy would be the natural inclination. The band’s latest album, the aptly named “Foundations of Burden,” is a six song, hour-long journey into some rather depressive territory, but the band’s penchant for heaviness and intensity keeps the record from being excessively mopey. As soon as the opening track, “Worlds Apart,” kicks in with a heavily reverbed, modal guitar riff, the first thing you’ll notice is the fantastic production. Whereas their debut release, “Sorrow and Extinction,” relied on more of a direct in-your-face production style, “Foundations of Burden” is an album where the sound is so deep it sounds like you could swim in it, live inside of it, or throw a rock down into it and have it fall forever. Significant shifts in production can often be a risky manoeuvre for bands, but Pallbearer seems like a group that is very self aware in terms of their sound and how it is translated to their listeners. Credit must be given to singer/guitarist, Brett Campbell. He is a strong vocalist and his singing style is a considerable part of what makes Pallbearer stand apart from other groups of their ilk. Campbell keeps his vocals on the melodic side, which is a good accompaniment to the band’s funereal guitar tones. He soars distinctively over the thick riffing of “Foundations,” which may be the heaviest track on the album. Fans of rhythmic, low-tuned, palm muted guitars should really go for this one. 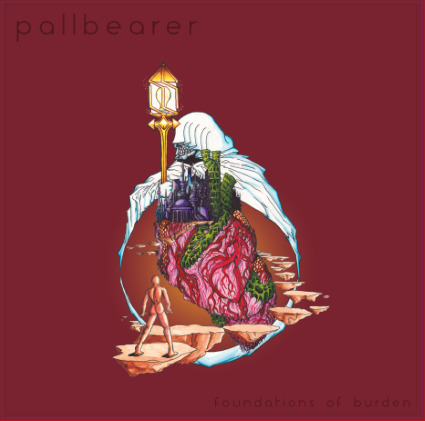 As is the case with most of Pallbearer’s material, “Foundations” is a pretty lengthy tune, (although it is one of the shortest on the album.) It has a nice breakdown into a melodic bridge with some atmospheric guitar effects before the heaviness comes back into the foreground. The loud/quiet/detuned/melodic aspects of “The Ghost I Used to Be” is also not dissimilar to what a lot of great bands used to do back in the ‘90s, but Pallbearer very much succeeds in keeping their style in the here and now, and doesn’t sound anything remotely like a throwback band. All in all, “Foundations of Burden” is a fine offering from these fan favorites. Because the band is inclined to epic song structures, Pallbearer is probably a group that sufferers of short attention spans should avoid. They are also the sort of group who’d have a difficult time convincing extreme metal listeners to get behind what they do. However, it’s highly unlikely that those who favor a standard song format, or those who enjoy guttural abrasiveness, would seek out a band like Pallbearer. They may have come from humble beginnings in their home state of Arkansas, but with the amount of praise they’ve received, along with their ever increasing fan base, Pallbearer is a band who should enjoy reaping the rewards of the seeds they’ve sown, both at home and far away from those southern fields they’ve known.